As I mentioned last week, there haven’t been many new B2C marketing automation products in recent years. But this doesn’t mean the industry has been stagnant. New developments have come from established vendors who are steadily expanding their products. Neolane has been one of these, growing from its roots in email to encompass other outbound and inbound channels, and more recently with a slew of social and mobile marketing features. One of its offerings, originally launched in 2009, is its real-time interaction manager, Neolane Interaction. - it supports both batch (outbound) and real time interactions. This is unusual, because efficient processing usually takes different data structures and methods for batch vs. real time. But Neolane cites one customer delivering 10,000 Web recommendations per minute and another sending ten million customized emails per week, so it has apparently found a way to handle both. Supported channels include email, Web, social, mobile, call center, point of sale, and SMS. - it uses the same offer library for real-time and outbound campaigns. This means that offers can be used interchangeably in both types of campaigns – something that considerably simplifies program design and analysis. Each offer can include separate content for the different channel formats. Users specify which offers are available in which channels, to ensure an offer isn't recommended where it shouldn't be. - it draws data from the Neolane marketing database as part of its offer selection rules. This is different from most interaction managers, which query external systems rather than maintaining their own persistent customer database. (Neolane could also do external queries.) Again, this approach raises a technical eyebrow, since traditional marketing databases are not structured for real-time interactions. But Neolane seems to pull it off. I suppose it helps that Neolane can attach to any data structure, so clients who want real-time interactions presumably build a real-time-friendly database. - it supports both anonymous and identified customer interactions. Most real-time interaction managers make customer-specific recommendations, although Web recommendation engines are often designed for anonymous visitors. It makes sense for Neolane to support both, again serving the greater goal of providing one marketing system to meet as many needs as possible. - eligibility rules for each offer. There are also eligibility rules for offer categories, which save effort by applying the same rule to multiple offers. - offer arbitration (i.e., choosing which of several eligible offers to return). Offers can be ranked using fixed weights assigned to each offer; by calculating weights with a formula that draws on customer data; or with an unusual “autolearn” function that adjusts the weights to ensure that the offer will be seen. The system does not incorporate any of predictive modeling, although model scores built elsewhere could be used in weighting formulas. - each recommendation is independent of a larger dialogue flow. At best, marketers wishing to deliver a sequence of treatments could create eligibility rules that check for previous treatments. This limitation is typical of real-time interaction managers. - a simulation function that estimates how often each offer would be presented to an audience with specified characteristics. This helps marketers see the results of different eligibility rules and offer weights, which can be difficult to estimate in advance. It’s found in some but not all interaction managers. The downside of Neolane’s approach is that customers who only want an interaction manager must still purchase the full Neolane system. This isn’t necessarily cost-prohibitive: the company says its average deal for the base system plus Interaction is around $350,000. Actual fees depend on the number of interactions processed. The system is available for on-premise, hosted, or “hybrid” deployment (on-premise installation with Neolane-hosted email delivery). Neolane says about 60% of its clients choose an on-premise option. To end on a positive note: Neolane sold 22 new Interaction installations in 2012, up from 17 the year before. This makes it one of the company’s fastest-growing products. You may have noticed that I've been uncharacteristically aggressive in promoting the Customer Data Platform concept. Sorry, but I just can't help it: a new system category is even more rare than a new B2C marketing automation system (which, as yesterday's post pointed out, is much rarer than a new beetle). More important, I think the category itself is a very important development that could really help marketers solve some big problems. So it's worth several shoves to get the ball rolling. Along those lines, I am embarrassingly excited to report my formal whitepaper explaining the CDP in depth has just been published. It was sponsored by ReachForce but they had no influence on the actual content. (In fact, they probably would have preferred something a bit more on-message for their own marketing, so let me thank them for their indulgence.) You can download it here. Comments are welcome! Selligent Brings a New B2C Marketing Automation Option to the U.S.
I’m writing this post on my old DOS-based WordPerfect software, to get in the proper mood for discussing business-to-consumer marketing automation. * The late 1990’s were really the last time we saw major innovation in the B2C market, when vendors like Unica and Aprimo released their then-innovative systems to create lists for direct mail and, somewhat later, email campaigns. Since then, the number of independent B2C marketing automation vendors has actually dwindled** as major and not-so-major products were purchased by larger companies to bundle into integrated suites or just use internally. Even the leading survivors, including Neolane (founded 2001) and RedPoint (founded 2006) have their roots in traditional outbound campaigns, although they now support Web, social, and real-time interactions to varying degrees. Still, I’m excited as an entomologist with a new beetle*** to see another vendor in the space. Selligent isn't brand new – the company was founded in 2000 and its marketing automation system dates back about six years – but the company says it was built from the ground up to manage real time interactions. A deep dive left me seriously impressed. The first thing you need to know about Selligent is that while it’s new to the U.S. market, it is well established in Europe, where it serves 400 brands in eleven countries. It’s particularly strong among retailers and publishers. This experience translates into the types of refinements that can only be based on client demands. To pick a couple more or less at random, these include a matching engine that selects among hundreds of news articles to find those most relevant to individual subscribers (a sort of dynamic-content-on-steroids that’s important to publishers) and tools to manage product give-aways and rewards for viral sharing (important for retailers). They also include standard B2C features that are still lacking in most B2B products, such as precise control over user access to specific pieces of content, data, and system functions; planning hierarchy to schedule and budget for multiple marketing programs in separate organizations; and rules to limit the number of marketing messages each customer receives. 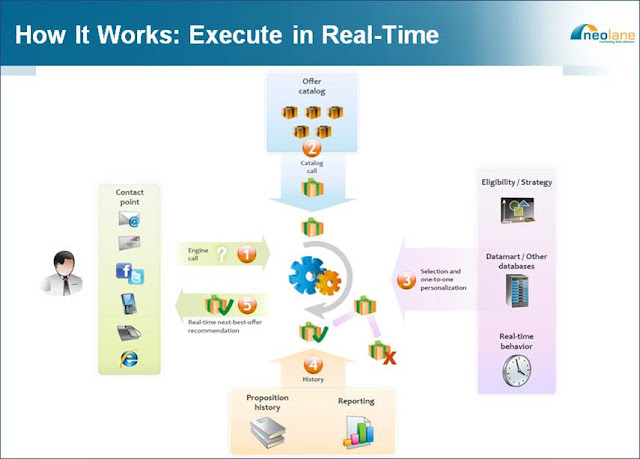 The basic architecture of Selligent is typical for B2C marketing automation systems. That is, it attaches a marketer-friendly interface for data access and analytics to an externally-built customer database. Brave users can add new fields and even entire data tables, and can import external data directly into the system. But the data must be matched on a fixed identifier, such as account number or email address, or combination of fixed identifiers. Data standardization, identity resolution, and change history (such as new vs. old mailing address) are largely handled elsewhere. Selligent also uses the familiar flow chart interface to design its campaigns. Beyond the superficial graphics – where Selligent is no better than average – it takes a connoisseur to spot the subtle differences among these implementations. Selligent does hit a number of fine notes, including A/B tests, option to reunite branches after a split, mix of data segmentation with marketing outputs in the same flow, ability to enter and leave flows at multiple points, option to direct customers to other flows, separate schedules for individual objects within a flow, and automated warnings of incomplete designs. Did I mention hints of almond? But the big differences are not visible. For example, you see that a campaign flow can include a survey. What you can't see is that surveys go beyond progressive profiling (replacing questions as they’re answered) to include branches based on customer profile and in-session answers, ability to re-ask questions after a specified period, asking questions in different languages but storing answers in one language, using the same question on multiple surveys and storing all answers in a single location, and providing statistics on completion rates, average time to complete, and which pages have the most validation issues and drop-outs. This is definitely above average for survey features in marketing automation tools, and more than competitive with many dedicated survey systems. 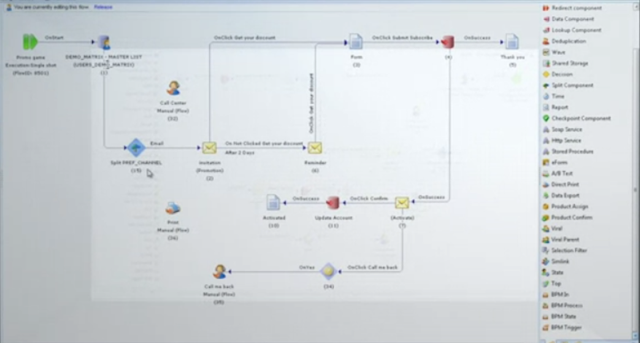 Selligent flows also support business processes that include external steps, such as manual review of an order. To do this, the system assign a “state” to a customer and then reacts differently within the flow based on that state. A separate “FrontOffice” module provides an interface for call center and other agents, and can apply rules to route customers to specific centers, teams, and agents. The system supports Microsoft’s computer-telephone integration (CTI) features, but doesn’t integrate with other phone systems. Basic campaign flows can send data to external systems via file exports or by calling an Application Program Interface (API). As these examples may suggest, one key theme for Selligent flows is tight integration across all channels. Perhaps the best example of this – and something I’ve looked for in many other systems and never found – is that its flows can control movement from one Web page to another. That may not sound unique, but if you look closely at other marketing automation flows you’ll see they typically end with serving up a Web form and then start independently with events triggered by completion of a form. All well and good, but it means you need to build a separate flow for each step in a multi-stage interaction. Even the real-time interaction management systems treat each recommendation independently, so the only way to create a multi-part dialog is to build separate campaigns or to build one campaign with complex qualification rules that test for completion of each dialog step before moving to the next. Both approaches involve much painstaking labor and room for error. Selligent, on the other hand, lets users connect one page to another on the flow diagram; the system then automatically embeds URL links to make the connection. I’ve had three clients ask me for this in the past year alone. Back in the realm of the normal, Selligent also offers a graphical email/Web page designer that supports the usual design features, personalization, dynamic content. More impressive, it has integrated multi-variate testing and lets users convert an email to a Web page, or vice versa, by pushing a single button. A single email or Web page can be shared across multiple campaigns with changes to the master object automatically deployed everywhere it’s used. Selligent doesn’t automatically store previous versions of contents as they’re edited and doesn’t provide formal check out/check in to avoid conflicting edits. But users can save and restore backup copies. The system also keeps an audit trail of who made changes and issues a warning when someone opens a document that someone else is already editing. Reporting in Selligent is based on information gathered from each object in a campaign flow. The specific data depends on the nature of the object. Users can also insert objects that capture specific information such as the number of people who have passed through. There are no standard campaign reports; instead, users build their own reports by assembling the object-level information. I found this a bit odd, but Selligent said each client wants something different and prefers to create their own. The vendor has recently added a Business Intelligence module, using Quiterian (recently purchased by Actuate and renamed BIRT Analytics) which provides ad hoc analytics and visualization. Data is exported from Selligent to the Quiterian database, but this happens automatically and selections made in Quiterian are automatically copied back to Selligent as segments for marketing campaigns. Selligent does have its weaknesses. It doesn’t easily support some advanced queries and splits, such as finding the top 100 customers per store or selecting the highest-spending person per household. It has no built-in predictive modeling or integration with third-party modeling systems, although it can easily import externally-created model scores. Somewhat surprisingly, it lacks geographic radius selections (although Quiterian has these) and doesn’t adjust sending dates or hours for the local holidays or time zones. Apparently it hasn’t needed these in Europe, where clients run separate campaigns for individual countries, countries don’t span time zones, and local units, such as provinces, are small enough to make distance-based selections unnecessary. This will surely change as it adapts to the U.S. market. Pricing for Selligent is based on modules used and number of unique customers. There is no separate charge based on message volume or number of users. The system can be purchased as a vendor-run service, deployed on-premise, or deployed locally with Selligent executing the emails. Price for the base system starts around $6,000 per month for 250,000 contacts. The vendor says its cost is often equivalent to what high-volume clients are paying for email alone. As in Europe, Selligent expects to sell primary through marketing agencies and service providers in the U.S. market. * Not really. I tried, but WP.exe won’t run on my current computer. Too many bits or something. ** See my list of mid-tier B2C systems. Seven of the twelve listed are now owned by someone else. 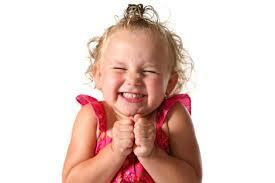 *** Probably more excited. New beetles are pretty common. Nearly 250 have been discovered this year alone in New Guinea and Central/South America. At their annual Amplify conference last week, Silverpop unveiled the culmination of a two year project that conveniently matches the Customer Data Platform (CDP) concept I’ve been describing for the past month. While the timing is just coincidental, Silverpop’s Universal Behaviors provide more evidence that a new breed of system is emerging. Silverpop’s new features load customer behaviors from all sources into a central database, match identities to create a unified customer view, and make the resulting information available for real-time, automated interactions across all channels. The central database and cross-channel treatments are two of the three capabilities I’ve defined for a Customer Data Platform. Silverpop falls short on the third CDP function, which is integrated predictive modeling. But it has partners who fill that gap. Many CDPs have been quietly maturing for several years. Silverpop's two-year gestation cycle is a good example. I can't say precisely why so many are emerging more or less simultaneously, but suspect a combination of business conditions and ever-more-urgent marketer needs. The long-term drivers are clear: more marketing channels make customer attention harder to attract, spread behavior across different media, and require coordinated contacts across channels. As a result, marketers need a unified customer database, unified campaigns, and way to deliver messages across whatever channels customers use now or in the future. This is what they get from a CDP. It’s less surprising to see another CDP system than to see it coming from Silverpop. After all, Silverpop’s twin heritages in B2C email and B2B marketing automation both use simple data models: flat lists for email and basic lead/contact/account tables for B2B marketing automation. Both types of systems traditionally merge customer data using only email address. Neither build a company's primary marketing database or shares data with external systems. So its quite unexpected to see Silverpop ingest data from any source, cross-reference any set of individual identifiers, offer access to the data, and send messages for delivery by other systems. So how do Universal Behaviors work? Each Behavior is first defined in Silverpop with a fixed set of attributes. Source systems then capture Behaviors and post them via an API to Silverpop. They are stored in MongoDB, a “NoSQL” database that supports high input volumes and multiple record structures. This is another departure for Silverpop, which uses the Oracle database in its core systems. Behaviors include whatever customer identifiers the source system can provide: email address, cookie ID, phone number, account number, etc. Silverpop uses matches from external systems to link all identifiers associated with an individual: for example, a Web transaction might include cookie ID and email address, while an email could contain email address and account number. Silverpop could later take a Behavior with any one of those identifiers and associate it with the same individual. But there are limits to Silverpop's customer integration powers: it doesn’t do “fuzzy” matching to merge similar identifiers or import third-party reference databases that contain such links. I'm beginning to see those capabilities are specialties that are not necessarily core features of a CDP because they're best purchased from third party vendors. The initial release of Universal Behaviors, set for July, will support predefined Behaviors from ArgyleSocial social listening, Webtrends Web site behaviors, Digby location-based marketing, Invodo video, and several as-yet unannounced vendors, as well as Silverpop’s own location-based and SMS offerings. It will later add more partners, provide a system development kit (SDK) for mobile apps, and eventually allow any company to build its own connectors. Once Universal Behaviors are loaded into Silverpop, they become available within the system for queries, program triggers, rules within programs, dynamic content, personalization, scoring, and analysis – pretty much anything that could be done with standard Silverpop data. Program outputs such as messages and lists can be pushed in real time to external systems to manage interactions. Silverpop has also created native integrations with Adobe and Episerver Web content management systems. These let those systems submit a visitor ID to Silverpop and receive Silverpop data to use in dynamic content and personalization. Connectors for other CMSs will be added as clients request them. Clients could also write their own integrations using a published Silverpop API or use tags to display Silverpop-generated content on any Web page. Currently, CMSs can access selected customer attributes but not the Universal Behavior database itself. Silverpop plans to provide full data access in the future. The mobile app SDK will go even further, allowing apps to execute Silverpop functions such as adding a customer to a program or sending an email. This is in addition to the standard features of submitting Universal Behaviors, reading Silverpop data, and rendering Silverpop-generated content. The critical point in all this is that Silverpop will integrate other customer-facing systems instead of only executing interactions itself. The integration includes sending data to Silverpop, reading data within Silverpop, and receiving Silverpop marketing treatments. In other words, the role of Silverpop shifts from delivering customer treatments to helping other systems find the best treatments to deliver. Of course, Silverpop still retains its original execution capabilities for email and some other channels. But it’s perfectly conceivable that a client could hook the new Silverpop features to someone else's email delivery system (not that anyone at Silverpop mentioned the possibility). This separation between a central data-and-decision platform and multiple independent execution systems is the core concept underlying the Customer Data Platform. I’m increasingly convinced it is the only way that marketers will be able to keep up with ever-expanding channels and customer expectations. By developing a structure that fits the CDP model, Silverpop has responded to a pressing client need and established itself in an important new category. I spent yesterday afternoon at HubSpot’s “Open House” in Cambridge, MA, during which they briefed the community on their business progress, introduced their new Social Inbox, described their approach to marketing and sales alignment, explained their “culture code”, and answered questions. 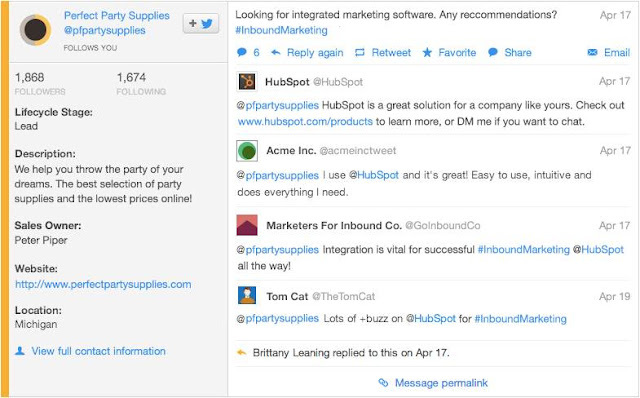 The most concrete news, Social Inbox, extends existing HubSpot features by more fully integrating social media monitoring and response with the HubSpot interface. The Social Inbox presents a list of Twiter posts by user-specified individuals or containing specified key words. Users can drill into each post to see a complete profile of the poster. The big deal in HubSpot’s eyes is the profiles include all information the HubSpot database about each person, and are even color-coded with the sales lead stage. The data includes Web and email behavior captured directly in HubSpot, data imported from Salesforce.com, and whatever else the system has available. Users can respond directly, forward a post to someone else, or add the poster to a HubSpot campaign. The system can automatically alert users to new Tweets as they happen or on a regular schedule. HubSpot said they couldn’t find any other product that combines this type of social monitoring with access to such deep profiles. I can’t immediately think of one either, although it might exist. Either way, uniqueness is less important than the value provided, which is considerable. What’s ultimately more interesting, however, is that Social Inbox is aimed at managing one-on-one interactions between users and individual contacts. This sort of contact management is quite different from HubSpot’s traditional focus on attracting inbound traffic or even from conventional marketing automation. The new features came up again later in the day, when the audience asked several pointed questions about whether HubSpot would eventually add a full CRM capability. This caused by far the most discomfort of any topic addressed by a management team which provides itself on transparency. Answers ranged from a coy “we think about a lot of things” to a fairly definitive stream of conscious listing of the arguments against adding CRM. The currently dominant line of thought seems to be that HubSpot already provides adequate features for clients who want light contact management, while adding full CRM features would only lead to a losing battle with Salesforce.com. Unstated but hovering in the background was the fact that Salesforce.com is an investor in HubSpot and might some day consider buying them to expand its own marketing scope. CRM would make HubSpot less attractive to Salesforce, since it would create a set of redundant features that need to be supported or removed. But the most fundamental reason that HubSpot management seems genuinely disinclined to add CRM is that they see HubSpot’s mission as transforming marketing. There’s a distinctly messianic gleam in CEO Brian Halligan’s eyes when he says this and the vision is no doubt shared widely across the company. 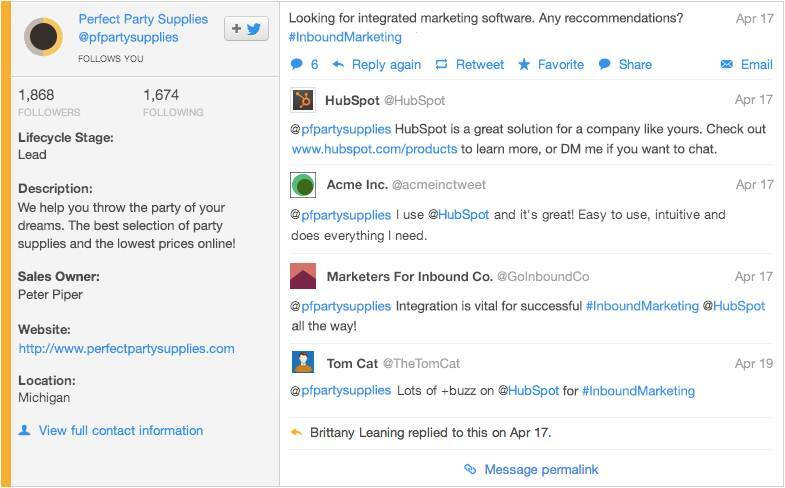 In fact, it’s arguably more surprising that HubSpot has overcome its marketing focus to introduce the contact management features already in place. My take is that customer needs – another HubSpot mantra – have driven the system in this direction despite management reluctance. The system has a will of its own. Admittedly, I’ve been arguing this for a long time: the need for integrated customer treatments will eventually lead marketing automation, CRM, and Web content management to become a single system, or at least to share a common customer database. HubSpot’s current vision of highly personalized data-driven marketing is consistent with this. The current vision is also quite different from the original HubSpot vision of attracting traffic through huge volumes of great (but not personalized) content. But the new vision is a logical extension of the original: once you’ve attracted people and start to learn their preferences, the more you’re able to make targeted content recommendations. And, the more content you have available, the more you need those recommendation to point people at the right materials. This brings HubSpot right back to contact management, because the same data used to recommend marketing content can, and should, be used to recommend treatments during personal interactions. It’s possible to simply push recommendations to an external CRM platform, but setting a connection for each point of contact quickly becomes a lot of work. The temptation to eliminate that work by building an integrated CRM system is hard to resist. As I say, the system has a will of its own. Incidentally, there is another way to look at this. The traditional view sees marketing as making automated contacts, while sales and service use human agents, supported by CRM, for individual interactions. This is why CRM seems foreign to a marketing system. But the automated-vs-human division is no longer so clear cut. Social media marketing is mostly done by humans through one-on-one messages, while many sales and service interactions are automated. In this view, HubSpot needs contact management features even if it rigorously restricts itself to serving marketers alone. The problem with this approach is that it denies sales and service the benefit of HubSpot’s data and customer understanding – a terrible waste of corporate resources. So this view also pushes HubSpot towards a unified marketing and CRM system, or at least a database and recommendation engine that’s accessible by both HubSpot and a separate CRM. I swear I didn’t mean to end up here, but this does lead to the Customer Data Platform I’ve been discussing over the past few weeks. I don’t think HubSpot management wants to move in that direction, or even that they necessarily should. But these things have a will of their own. It’s a slight stretch to call Provenir a CDP, because it doesn’t manage a permanent customer database. Rather, like most interaction managers, it calls data from external sources during each decision. But Provenir does have some customer matching capabilities and stores at least some information internally. Moreover, it completely meets the other three CDP criteria: predictive modeling, real-time decisions/recommendations executed through external systems, and a non-technical user interface. It’s also sold as the “glue” connecting data sources, modeling, and execution systems, which is exactly the role played by a CDP. So, what the heck…welcome to the club! Provenir is organized around process flows, which cover a particular task such as reacting to a Web site visit. Users define each process by building a flow chart, or, as the cool kids call them today, a graph. ** These, um, graphs***, can contain branches, loops, and other advanced structures. The nodes can also contain other graphs that define a subprocess in more detail. Nodes can perform a wide range of operations including data gathering, calculations, updates, decisions, and messages to external systems. Although setting these up is inevitably rigorous, Provenir makes it as painless as possible by providing help such as letting users draw lines to map fields from one system to another; building rules through score cards, tables and decision trees; and warning if a flow is incomplete. Provenir relies on external systems to assemble, integrate, and store customer data. Users can build matching processes with system graphs, although the vendor recommends connecting to other products to load reference data or do advanced "fuzzy" matching. Provenir can monitor source systems for selected events and issue queries to assemble data as needed. The social listening features can monitor Twitter for keywords and Tweets by specified individuals. These can trigger process flows that can retweet a message, send a direct Twitter message to the poster, or respond through another channel. The system can also monitor and post messages on Facebook. Other channels will be added over time. Predictive modeling in Provenir is also done in external systems. The system can import PMML code or call models in SAS, R, or even Excel. Data mapping functions can automatically extract the list of required variables from PMML, do basic transformations and calculations when loading model inputs, and manage parameters, constants, and local variables. Decisioning is Provenir’s greatest strength. The process flow…I mean graph…is inherently very flexible, and the ability to define rules as tables, trees, score cards, and other formats adds even more power. Users can set up champion/challenger tests as splits within a process flow; results are stored in a database for analysis and reporting. Users can also build simulated data sets, containing specified distributions of particular variables, and use these to forecast results of their flow designs. Such simulation is one mark of a mature decision system. Provenir has some built-in messaging capabilities, but most decisions are executed externally. The system has been connected with email, Web content management, call centers, campaign management, text messaging, and other execution platforms. Pricing for Provenir’s social listening product is based on the size of the customer database. Starting price can be as a low as several thousand dollars per month. The system is usually sold on a Software-as-a-Service (SaaS) basis, but on-premise licenses are also available. * For extra credit, compare and contrast Provenir’s primary Web site with the site for their listening division. ** Defined in Wikipedia as “mathematical structures used to model pairwise relations between objects”. *** Would it be even cooler to call them grafs or, better still, grafz?